Southeast Michigan's oldest outdoors show returns to the Suburban Collection Showplace in Novi, February 25 to 28, the 43rd annual Outdoorama! NOVI, MI — Sportsmen and sportswomen are constantly looking for ways to improve their hunting and fishing techniques so they can be more successful on the water or in the woods. 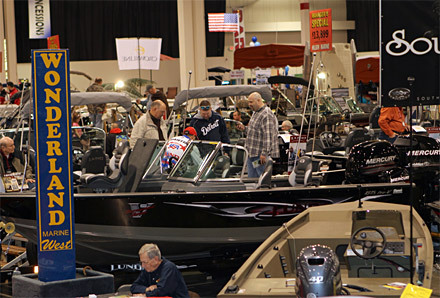 With a strong lineup of seminar speakers including nationally-acclaimed hunters and anglers there is no better place to improve your techniques than at the 43rd OUTDOORAMA, Feb. 25-28 at Suburban Collection Showplace, 46100 Grand River Avenue in Novi. From processing your whitetail or calling in deer and turkey, to catching walleye, bass or muskie OUTDOORAMA has it covered and no stone will be left unturned. "This year's lineup of seminar speakers who will be appearing on the stages at Outdoorama is one of the strongest we have assembled," said Show Manager Ben Nielsen. "Some of the top professionals in the country – most of them Michigan natives – are coming to Novi to share their expertise with show patrons." All seminars are free with paid admission. Tom Richardson has successfully called in and killed big bucks for 40 years. His secret is learning their unique language, not only vocalizations and what they mean, but scent and sight communication as well. Not only will Tom share his secrets on how to successfully " talk " to and call deer, he also will teach you how to call in deer with a squirrel call, turkey call and with nothing more than a handful of stones. His unique, proven outside-the-box techniques combined with his sense of humor make for a very enjoyable learning experience. Fred Abbas ranks No. 1 all-time for trophy bucks tagged in Michigan. He's the only Michigan hunter to have officially entered four whitetails in the record book in one season (1990, the last year with a four-buck limit.) Fred invented the Bowgrunter Plus, Scent Web and several other hunting aids. His seminar is one deer hunters won't want to miss. Once you've picked up tips on how to tag a whitetail, be sure to sit in on Steve Francis' seminar on processing a whitetail. The owner of Country Smoke House in Almont, MI, Steve will demonstrate how to field dress, handle, butcher and package your next white-tailed deer. Country Smoke House processes thousands of deer each fall. Francis is an expert in his field and he'll start with a fresh deer and walk through every step of the process. This seminar will take place on Saturday. Michigan's Mark Martin was inducted into the Freshwater Fishing Hall of Fame in Hayward, Wisconsin last year. A nationally acclaimed walleye pro and owner of the Mark Martin Vacation Ice Fishing School, Martin will share his knowledge on targeting walleyes using modern-day techniques. Mark Romanack is an author, outdoor writer, walleye fishing expert and host of Fishing 411 television show. Romanack will be on hand all four days of OUTDOORAMA presenting multi-media seminars and providing tips on trolling for walleyes in the Great Lakes. Lance Valentine is the founder of Lance Valentine's Walleye 101 and the "Fishing Education Center." Lance has been fishing for walleyes for over 20 years and has gained the knowledge needed to become an expert on marine electronics. Lance's seminars Sonar: The Basics and Beyond will helps you understand, tune and interpret your sonar unit. With spring fishing right around the corner, his seminar Jigging the Detroit River will help you maximize your river-fishing effort. Seth McCullough is an avid turkey hunter, calling contest champion and the owner and founder of Bully's Wild Turkey Calls. The Michigan native will offer tips for better turkey hunting and discuss the life cycle of the wild turkey in his informative seminars. Tony LaPratt has tagged 42 trophy-class whitetails by utilizing and developing his own "unique hunting and ultimate land management technology." LaPratt will share his secrets on whitetail land management with OUTDOORAMA patrons all four days of the show. Food Plot expert Ed Spinazzola expert and author of Ultimate Deer Food Plots, will be on hand daily to discuss all aspects of growing food plots for deer. Wayne carpenter (bass), David A. Rose (traveling to Alaska), Jake Romanack (Walleye), Jason Herbert (hunting on a dime), Kevin Backus (muskie) and Mike Pittiglio (muskie) will also be presenting seminars at OUTDOORAMA. A special added bonus for OUTDOOPRAMA patrons is free crossover admission to the 9th annual Cottage & Lakefront Living Show, held concurrently at Suburban Collection Showplace. The show that celebrates Michigan's great outdoors is February 25 to 28. Bring the kids and grandchildren. Show hours are Thursday, 3 to 9:30; Friday, noon to 9:30; Saturday, 10 to 9; and Sunday, 10 to 5. For more information, go to http://www.Outdoorama.com or call 800-328-6550.